Since it started out as a Kickstarter, there are several versions of Scythe knocking about. In the same way as a vegan identifies themselves in the first two minutes of meeting them. 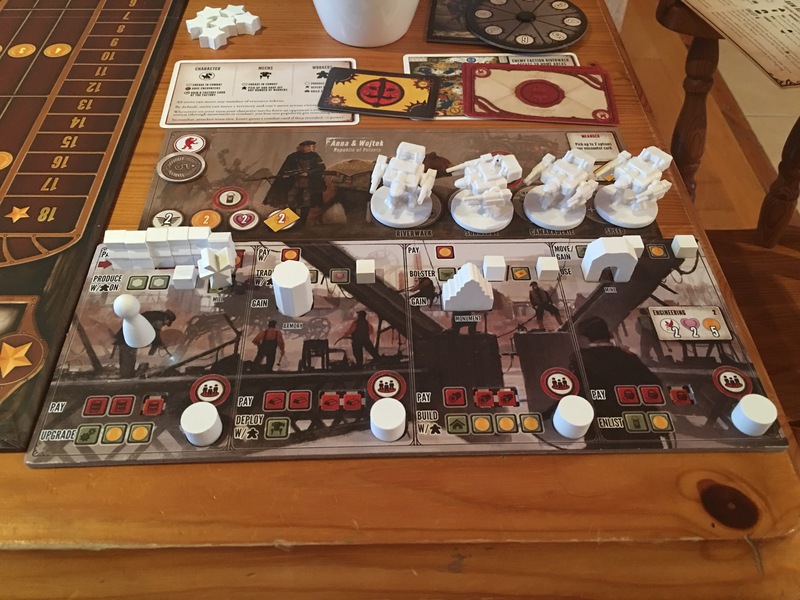 An owner of scythe will tell you how Their copy is so much better than the base game the little people would buy retail. BTW I’m not disrespecting vegans. I have a number of vegan gaming buddies I have tremendous respect for. (Granted they rarely come to games night because I live up a hill and bless, they don’t have the energy to walk up it) On with the critique. 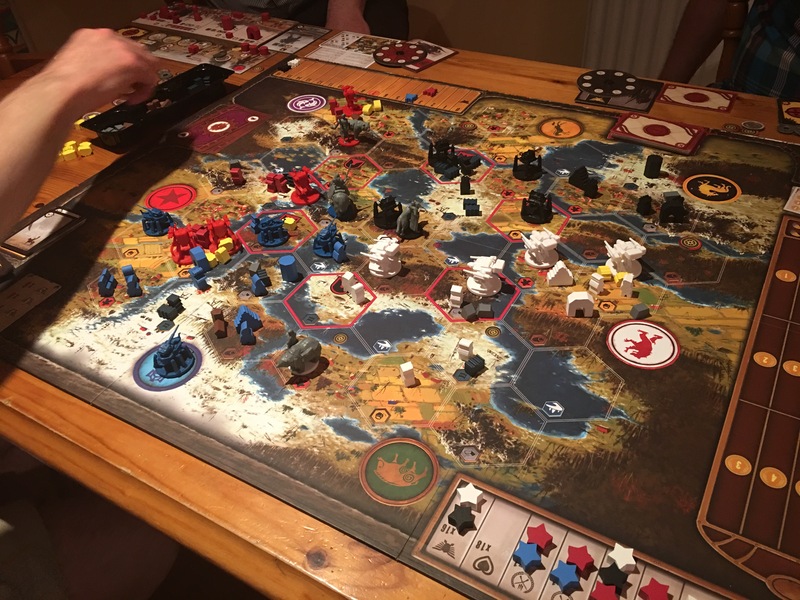 We played the better version of scythe with the dials and extra bits and bobs but it doesn’t matter it’s the same game no matter what. We played with four. 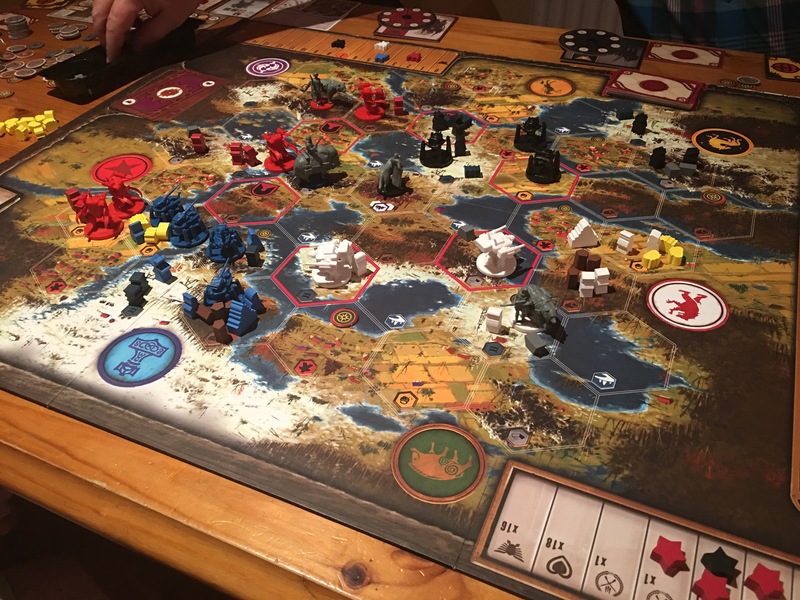 Scythe is not a conquest game in the traditional sense. It’s not all about land acquisition (although it’s a help) and unlike most map games having an enemy military unit right up against you doesn’t mean war is imminent. It MIGHT mean a battle is coming but it’s by no means a sure thing. scythe is all about the medals or more accurately the milestone stars. When you’re building a economy war is a real inconvenience. Milestone stars are awarded for a number of events. Building all four of your mechs, upgrading everything, winning your first and second battle, gaining maximum power or popularity as well as a few other things. Once one player gets to six stars the game stops and everyone counts their points. It’s quite possible for someone to end the game by getting six stars but still lose on points. The game plays out on a beautifully produced map delineated by around 60 hexes or so it’s a pretty tight map. Hexes produce one of a number of different resources. oil for upgrading, metal for building mechs, wood for bolstering (upping your power and popularity) and food for recruiting. The last resource is people or more accurately worker meeples and it’s these dudes in the right spot that harvest the resource from a hex when a produce action is taken. As for actions, each player starts with a control board made up of two different pieces. Each board is a little different so play varies depending on whom you pick. Each faction is unique which equates more to starting resources and a special ability rather than a considerable difference. They’re certainly not asymmetrical nor are their goals. At first view the control panel looks like the controls of a steam train but it becomes all very logical half way though the game. I highly recommend you play with at least one person who’s played before or you’ll scratch your head bald first game. It’s not that’s it’s overly complex but it is a little overwhelming to start. You need to keep an eye on several resource levels to survive. That said I found the game forgiving but I was playing with relative newbies (myself more so) and a veteran would have the game won before you got your second mech on the board. Difficulty level it’s in or around the same as say Game of Thrones the board game. You start with a hero and two worker meeples. The starting positions are all around the edge of the map the center of which contains a factory that once accessed gives you an add on action for your control panel. Controlling the center is also worth a chunk of points at the end so it’s a bit King of the hill. Again this is not a bloody game. Combat is expensive and players only attack if they’re sure of a gain. Posturing is an excellent substitute for violence I find. The game progresses with you expanding out and harvesting resources. Building your mechs and upgrading your economic engine. In this respect it’s a little bit solo. It’s hard to block others from achieving their economic goals. You can step in and take hexes from others but there’s plenty of resource hexes to go around and it would be foolish to start a war to mildly inconvenience another player. Now it’s important for me to stress this is a first review. There are veterans of this game who know better than me but this is my impression of things. What’s novel with Scythe is the resources. When harvested they remain on the hex you plucked them from. When you spend them they disappear off the map as your workers burn them but while they’re being built up on the map for “a big shop” they can be raided by other players. Later in the game when you’re building a stockpile of resources to score bonus points you’ll need to protect them jealously from others. 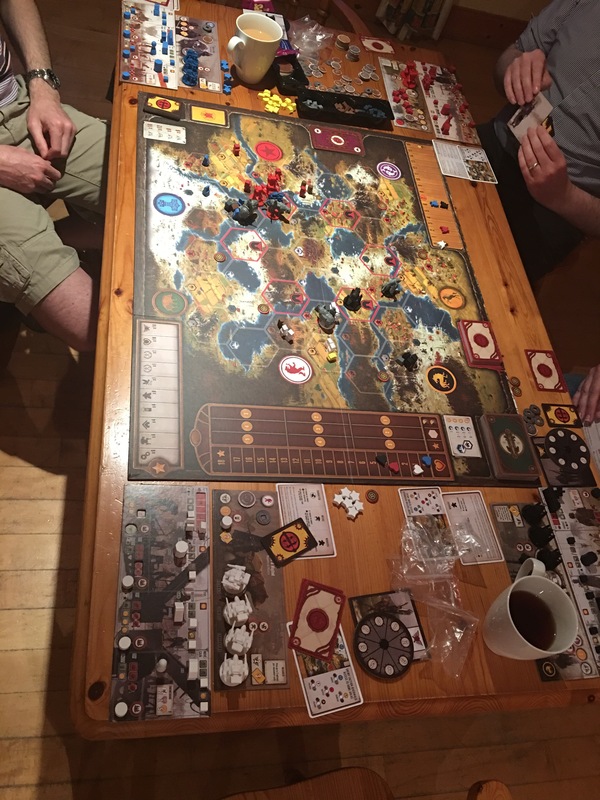 Scythe is an unusual game. It’s definitely unique. It’s neither fish nor foul/worker placement nor conquest, it’s a too simple to say it’s a bit of both. The space game eclipse is the closest I’ve seen to it but even that’s quite different to this beast. The game is beautifully produced. The artwork from Jakub Rozalski is stunning. The cards and pieces are excellent quality. Not QUITE up there with the homogenized style of Fantasy Flight but not far off. The minis have character (some of them are characters) Everything is lavish. More so if you went all in on Kickstarter. It can’t be faulted. The question I guess is, is this any bloody good? Certainly. Yes it is. It’s probably not what you would expect from the box. It’s not mechs conquering conquest. It’s more economic that ballistic. The designers have done something wonderful here. They’re created something ever so slightly different, a twist to the norm. I highly recommend trying this game out. It will be front and center at Knavecon 10.